Bells 1 -12 cast by John Taylor & Company in 1914. It was the first 'Simpson tuned' ring of twelve cast by the firm. Extra treble and flat sixth cast by Whitechapel Bell Foundry in 2000. The majority of the bells hang in the original timber frame of 1798 with two metal rider frames above, in which hang the Taylor treble and the flat sixth. A training dumb bell is fitted on the intermediate floor. The circular ringing room has a good collection of peal boards and normally holds the Association striking competition cup. 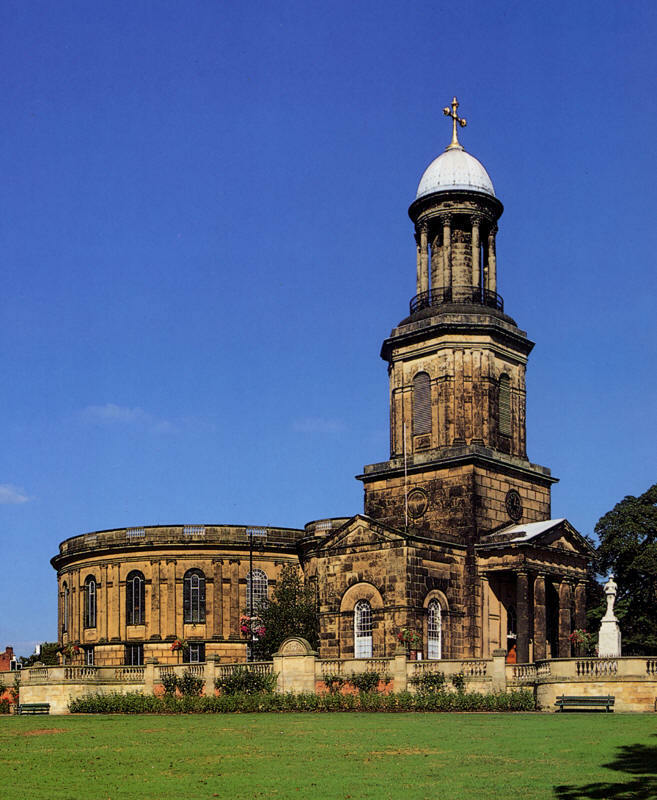 The church was designed by George Steuart and was built to replace Old St Chad's Church which fell down in July 1788. The design of the new church caused considerable controversy but it was eventually built on a different site and consecrated in 1792. In the churchyard may be found the grave of Ebeneezer Scrooge, a reminder of the filming of 'A Christmas Carol' in the town. The tower door is external on the west side facing the park. There is parking for coaches outside the church. There are pay and display bays on St Chad's Terrace and the church has its own paying car park, but this is often full. Public car parks are 200 yards past the church on the one-way system, at the bottom of Claremont Bank. The traffic system in the town can be confusing and slow - visitors should allow extra time to reach the church. It is far quicker to walk between St Chad's and St Mary's rather than to attempt to drive. There is a toilet in the entrance vestibule of the church and others are located just inside the gates of the Quarry Park. Numerous pubs, cafes and restaurants are available in the town. in 1962 to take the sharp second bell.